The product spectrum of Franckh-Kosmos Verlags-GmbH & Co. KG, abbreviated to KOSMOS Verlag, is extremely diverse: guidebooks, nature guides, non-fiction, cookery books, DVDs, books for children and young people, games, experiment kits and, increasingly, e-books and apps to complement the range. As an added extra to supplement the successful printed guide to garden birds “Welcher Gartenvogel ist das?”, the e-book version also includes audio samples. 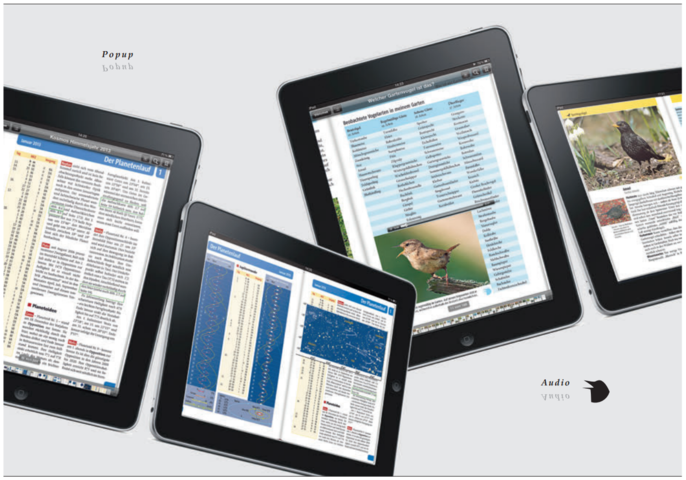 Unlike classic media, this enables nature lovers to identify birds instantly in the field from the sound of their call using mobile devices such as an iPad or iPod Touch, or discover the variety of different bird sounds at home. le-tex handled the conversion of this work to a fixed layout EPUB and the integration of the audio data. It also designed the e-book version of the “KOSMOS Himmelsjahr” astronomy yearbook with special requirements for internal links and pop-ups.